Democracy in a Gutter, Literally. A man entered a gutter to clean it and fainted in the bad air. His comrade waiting outside realized this and entered the gutter to save him. He too fainted. They both died of asphyxiation. This happened a mere two days after Supreme Court outlawed manual scavenging again, and ordering, not 'directing', the states to strictly enforce the Prohibition of Employment as Manual Scavengers and their Rehabilitation Act, 2013 passed by the parliament last year. The two men were not supposed to enter the drainage area without written approval of the chief officer and an insurance cover of Rs 10 lakh by the employer under both the provisions of act and the Supreme Court order. The act, in fact, bars anyone from entering such a drainage unless in an extreme emergency and only with full protective gears. These men were bare bodied, armed only with the most rudimentary tools- , namely a broom and a stick to manually break the blockage. This happened in Gujarat, whose chief minister Narendra Modi never tires of boasting over Gujarat model of development. Being the official Prime Ministerial candidate of Bhartiya Janata Party, the main opposition party in India, singing the praises of developed Gujarat has become his main weapon not merely to canvass for his party's victory, but also to get rid of the blot of 2002 pogrom of Muslims that happened in his supervision. Expectedly, Mr. Modi did not open his mouth regarding these two deaths. Likewise, he remained silent when a third death occurred just a day later. Interestingly, Indian National Congress, the leading partner of United Progressive Alliance currently in power, did not make it a political issue to address despite being pushed into a corner on other issues ranging from corruption to selling out. Why did it decide to lay low instead of pushing for a resolution after getting such clear evidence of the hollowness of the development claims of Mr. Modi? It could have been the proverbial last nail in BJP's coffin in the polls. The reason behind this is simple. Congress ruled states have performed no better than Mr. Modi on the issue. The failure is so comprehensive that manual scavenging continues in Delhi, the national capital, as a survey by the Department of Social Work of Delhi University identified 1,085 scavengers still working in Delhi in 2009. Similar is the situation of Karnataka which reported the death of a manual scavenger as recently as March 4 this year. Tamilnadu, another affluent state, fares much worse with 30 manual scavengers having lost their lives since February 2012. With the richer states' performing this dismally, one can easily guess at the state of affairs in poorer ones. The lack of political will is further confirmed by the fact that while there was no dearth of lip service on the issue there was very little action on the ground. An example of this: Employment of Manual Scavengers and Construction of Dry Latrines (Prohibition) Act, 1993 that was replaced by the new one was not published in the gazette of India until 1997 and no state had promulgated it until 2000. If there remained any doubts over failure of the 1993 Act, they were all put to rest by the 2011 Census report that counted 7,94,390 operational dry latrines in the country. As all these states are governed by political parties and alliances pitted against one another, and thus making manual scavenging a poll issue will harm them all, it seems to be both parties have an interest in this "don't ask, don't tell" attitude over the issue. But for the relentless struggle of Safai Karmachari Andolan and other civil society groups, they have almost successfully swept the issue under the carpet. Rest assured, neither Mr. Modi, nor his opponents, will kick this hornet's nest for the fear of the stings they will receive. They have always showed a great amity when it involves not raising the issues that would shame them all. This is why BJP never grilled Prime Minister Manmohan Singh over his inaction despite describing the practice as "one of the darkest blots on India's development process". He, likewise, has a habit of identifying national shames, blots, and humiliations and then sleeping on them. Remember that he called malnutrition a national shame and then set up a Prime Minister's National Council on Nutrition way back in 2008, but the council never convened except once in 2010 and not a single decision taken in that meeting was ever implemented. The question, however, is what sort of a democracy can force a section of its citizens into a gutter without any protective gear? What sort of a democracy can watch them dying of asphyxiation, one after another, as each enters the same gutter to save the previous one? What sort of a democracy can then look away with impunity, without doing as much as paying compensation for the deaths? The sort of democracy that can is India, as evidenced by its actions and more so by its inactions. For the uninitiated, 300,000 manual scavengers (mostly women) form a miniscule part of the very populous India and are therefore disposable for electoral battles. Further, being situated at the lowest rung of the system of graded inequality, in Dr. B R. Ambedkar's words, their issues are rarely picked up by media or even by parties fighting for dalit rights. The fact that the state is is equipped, both economically and technically, to radically restructure sanitation system and eradicate manual scavenging is the only thing worse than the denial mode it goes into. Just think of the crassness of the system that is planning to send a manned mission to moon while forcing its people down the drains, literally. Think about a democracy that invests a huge part of its budget for buying bombers but does nothing to improve the sanitation systems that caters to a mere 33 percent of population leaving the rest to fend for themselves be it by defecating in open or throw everything in rivers. How does it get away with that? It gets away because it knows that it has a community held to ransom by the repulsive caste system to do the job. It gets away that this caste system that forms the base on which façade of modern democracy is superimposed in India will deflect the blame away from them. Supreme Court's March 27 order will hopefully make a dent in the system that produces and perpetuates this illegal practice with impunity. That would, however, depend upon the will of the people to stand up and be counted for their struggles as manual scavengers. Compensations, (which often remains unpaid) is a positive step, but definitely not a solution to the problem. The only concrete way is fixing command responsibility and making the officer in charge of the municipality, division, or any other department illegally employing manual scavengers responsible for any accidents including death, and punishing him/her proportionately in such circumstances. 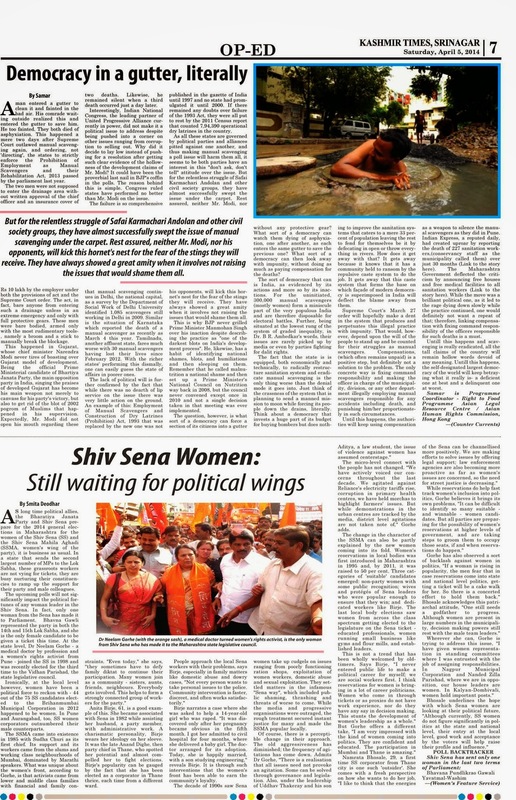 Until this happens, the authorities will keep using compensation as a weapon to silence the manual scavengers as they did in Pune. Indian Express, a reputed daily, had created uproar by reporting the death of 227 sanitation workers,(conservancy staff as the municipality called them) over just 30 months (Link to the story here). The Maharashtra Government deflected the criticism by announcing free houses and free medical facilities to all sanitation workers (Link to the story here). While the move was a brilliant political one, as it led to the rage dying down slowly while the practice continued, one would definitely not want a repeat of that; therefore, linking compensation with fixing command responsibility of the officers responsible for such deaths is a must. Until this happens and scavenging is really eradicated, all the tall claims of the country will remain hollow words devoid of any meaning. Until this happens, the self-designated largest democracy of the world will keep betraying what it really is- a deficient one at best and a delinquent one at worst.